WeWork occupies more Manhattan real estate than any other company. Flexible office provider Knotel operates around 70 co-working spaces in NYC alone. Convene, another competitor, signed its largest lease ever last month (116,000 square feet) on 5th Avenue. Co-working is just getting started. In just the last year, co-working spaces have tripled their share of Manhattan’s office-leasing activity to around 10%, according to real estate brokerage firm Avison Young. Across the country, the number of square feet they occupy has jumped nearly 400% over the last eight years. As the market for flexible and customized offices continues to boom, it's not just startups and small businesses that stand to benefit. More and more, larger companies that don't want to be locked into decades-long leases are considering the upsides of flexible spaces. As co-working continues to grow, there's something to consider. Recent real estate studies show investors think highly of buildings that include 15%-30% co-working space, according to a study by global commercial real estate services company Cushman & Wakefield. However, once that occupancy crests about 40%, investors could begin to discount the building's value. The lesson? 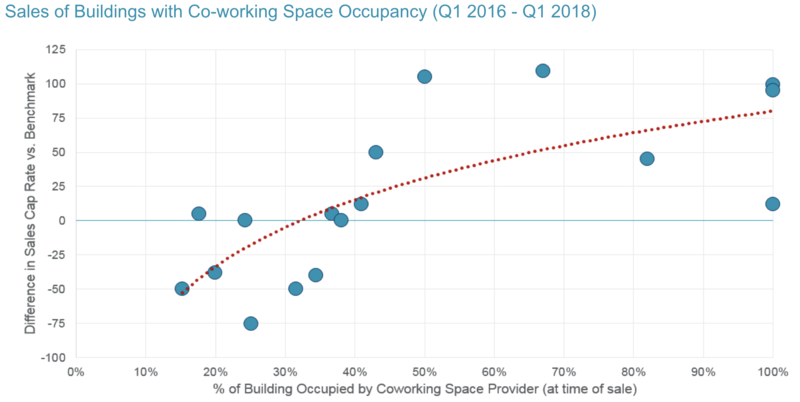 Co-working spaces will need to spread out. That headache is mostly for building owners to bear, but it could trickle down in their willingness to set aside too much of their spaces for flexible offices. The fear is that co-working spaces—often locked into long-term leases of 10 years or more—rely only on the short-term leases of their tenants, a model making them susceptible to plummeting occupancy in economic downturn. That’s exactly what happened in 2001 to Regus, a European co-working space provider. It was hit hard in the financial crisis and filed for bankruptcy in the U.S. two years later. Startup investors, however, seem unfazed. WeWork, which raised $4.4 billion in equity funding from SoftBank last year, announced another $1 billion in follow-on capital from the Japanese lender in August. While the co-working company says it was able to double its revenue for the first half of 2018 to more than $760 million, it also reported first-half net losses, compared to the same time in 2017. Its rapid growth continues. Knotel raised $70 million earlier this year in a Series B led by Newmark Knight Frank and The Sapir Organization. The round brought the fast-growing company's funding to $95 million two years after its launch. Knotel designs and operates customized, flexible office spaces for companies in New York, San Francisco, London, and Berlin. Convene raised a $152 million Series D to bring its total funding just over $280 million. Launched in 2009, the company provides flexible meeting and working spaces in New York, Boston, Philadelphia, Los Angeles, and Washington, D.C. Founders have their sights set on global expansion. 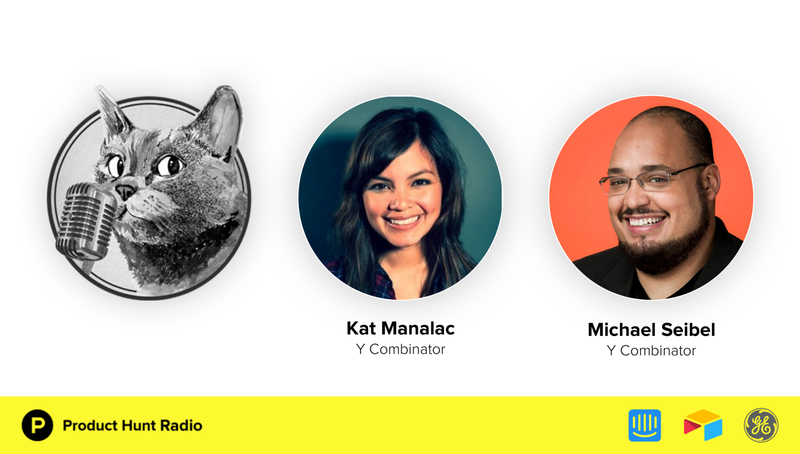 In this episode of Product Hunt Radio, we visit Y Combinator to talk to two integral people: Kat Manalac, partner at Y Combinator, and Michael Seibel, CEO of its accelerator program. They cover everything from the evolution of Y Combinator to the mistake founders make when pitching their company to advice for finding a technical cofounder. 💰 CollegeBacker is a fintech company making saving for college simple, smart, and social. Any parent can start investing in a tax-free investment account in just a few minutes Hiring a senior front-end engineer. 👰 Joy is building a virtual event planner for events both large and small. From a concert or a school reunion to a destination wedding on a tropical island. Hiring a senior product designer, lead backend engineer, and more. 📈 Rimeto is a workplace directory that drives productivity and collaboration by surfacing critical information. The company is bringing mobile first user experience to workplace productivity. Hiring a software engineer. 🛍️ SaleZoom discovers quantifiable value through data mining for e-commerce sellers. The company is now expanding into automated e-commerce advertising. Hiring a software engineer.